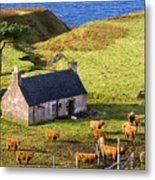 Highland Cottage With Highland Cattle by John McKinlay - 10.000" x 6.625"
Highland Cottage With Highland Cattle framed print by John McKinlay. Bring your print to life with hundreds of different frame and mat combinations. Our framed prints are assembled, packaged, and shipped by our expert framing staff and delivered "ready to hang" with pre-attached hanging wire, mounting hooks, and nails. Hi Conor thanks for your comments. Thanks, Nicole - it's a beautiful place in the summer, but the winters are long and hard! 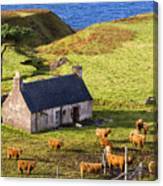 really beautiful, this is place where I want to live..
A remote highland cottage with a lone pine tree photographed with a small herd of highland cattle.